Two students create a socially responsible clothing company after a trip to the Dominican Republic inspires them to promote literacy. Two Hampden-Sydney students have decided to put the College's "good men and good citizens" motto into action in an unconventional way-by launching a philanthropic business while maintaining full academic loads. Although many young entrepreneurs launch their first ventures while still in school, few take on such a risky and time-consuming project with the primary goal of raising money for charity. But Jacky Cheng '18 and Tanner Beck '18 did exactly that in the spring of their junior year. Inspired by their participation in College-sponsored mission trips and motivated by the philanthropic work of several H-SC alumni, Jacky and Tanner launched Pan, a clothing company "on a mission to eliminate illiteracy." 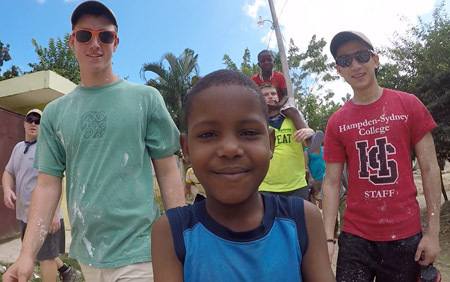 For Tanner, the emotional bond he formed two years ago with a young Haitian refugee, Ubi, on a Hampden-Sydney College trip to the Dominican Republic turned into a commitment to the child's education. He says, "I decided that the most significant thing I could do for Ubi's family was to pay for his school fees and books." Educating just one child wasn't enough, though. He returned from his second Beyond the Hill trip in January 2017 determined to make basic education a reality for even more children. "Ubi's parents were so incredibly thankful that their son could go to school. Their response made me realize that, in many parts of the world, education is not readily available, yet I believe it's the key to long-term impact." Knowledge is so powerful; ultimately it's the tool that will give people opportunities and help communities create jobs. Jacky's belief in the power of education to transform lives comes from his own personal experience. The son of Chinese immigrants, Jacky knows first-hand how valuable his educational opportunities are-opportunities that his parents and grandparents never had, but were determined to give him. "When my parents moved to America, they could barely speak English, but they worked hard to provide me with the best schooling and activities they could," Jacky recalls. "From a young age, I knew how much they valued education, and now I have the chance to be the first in my family to graduate from college." Now Jacky wants to use his own education to help others. He says, "Knowledge is so powerful; ultimately it's the tool that will give people opportunities and help communities create jobs." Jacky and Tanner, both economics majors and members of the College Republicans, originally thought that law or public policy, rather than business, would be their avenue for making a positive change in the world. But a chance meeting last fall with H-SC alumnus Toby Usnik '85-well-known in the business world for his work at Christie's International, the New York Times Company, and American Express-changed Jacky's perspective. Usnik's passion for corporate philanthropy and social responsibility convinced Jacky that partnering a business with existing charities might be the fastest way to make an impact. Usnik was on campus to address students about purpose-driven careers, but when he talked with Tanner and Jacky, he found that "these young men were already practicing what I was preaching-defining their purpose and integrating it into their careers...and making the world a better place in doing so." 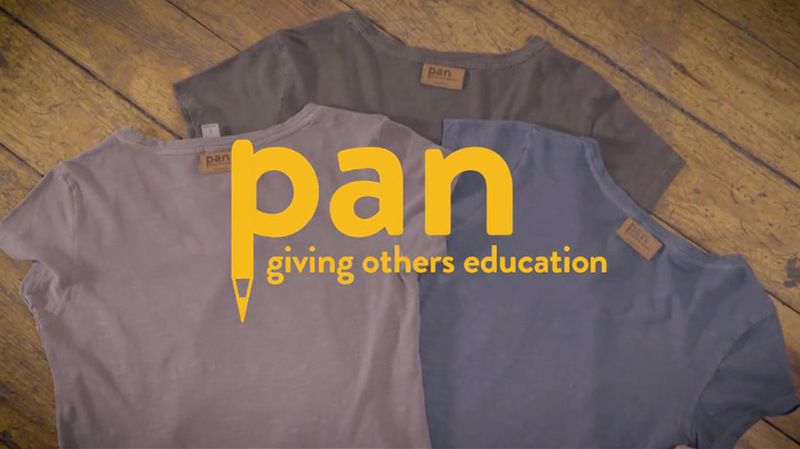 In May, after further mentorship from Hampden-Sydney alumni and faculty, the two students launched a month-long Kickstarter Campaign to fund Pan, a socially responsible clothing company that donates five textbooks for every item of clothing it sells. They've also formed a partnership with Hope for Haiti, a well-established charity that already has an active book program and staffs 24 schools on the island.While both students admit that starting a business from scratch is far more work than they ever imagined, they feel that, at this stage in life, they have very little to lose. Preparing to launch the business just two weeks before final exams, Tanner noted, "There's no better time to do this than now. Of course, the time management has been difficult, since we both spend about four hours a day working on the business on top of our academic work, but we've learned so much about the world beyond the classroom." They hope the business will grow quickly, but Jacky says, "I don't think success is measured in profit, but in finding purpose and fulfillment. We've found something meaningful in our lives and we've decided to pursue it." Pan, created by Tanner Beck '18 and Jacky Cheng '18, annouces their launch with a video introduction.